Sponsored Post: This post contains affiliate links and I will be compensated if you make a purchase after clicking on the links. To see more on this, please see my disclosure policy. Thanks for supporting my site! Hi, friends! A few months ago, I was blessed to be able to win a 3 month subscription to Little Passports in a giveaway from one of my fellow homeschool bloggers, The Natural Homeschool. 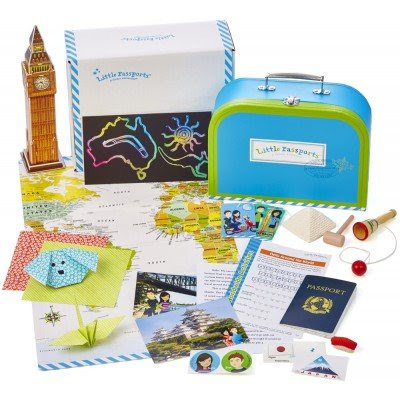 I was super excited because I have always heard many wonderful things about Little Passports. After the 3 months, we are hooked! My sons who are four and six years old, absolutely love the Little Explorers Set. They have learned so much about different places in the world from different landmarks to musical instruments, and they are so excited to get their own package delivered in the mail. 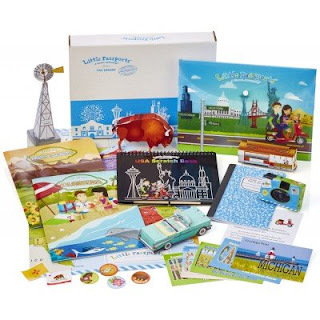 Each month, they are sent a letter or postcard from Toby, Mia, and Max of Little Passports, along with a souvenir, activity booklet, and a fun flashlight puzzle that highlights what that specific month is about. The first month everything comes in the cute Little Passports suitcase, along with materials for that month. Each month after that, a large envelope is sent with all of the materials and also fun stickers and luggage tags, to show what places the child has learned about. The suitcase is also a great storage case to keep all of the souvenirs and materials in one spot. I wanted to give you all a sneak peek into what we were sent over the last few months, so you can actually see what you get if you sign up for Little Passports. I am a visual person, and I love being able to see what is included when I buy something. There are three different packages available for students ages 3-5 (Early Explorers), ages 6-10 (World Edition), and ages 7-12 (USA Edition). We used the souvenirs included in one of the months and actually put them on a map in a textbook, matching the landmark to the country. The boys know looking at each of the landmarks, what country that it is from. We went to the museum the other day, and they commented how one of the buildings reminded them of the Tower of Pisa! We were sent this huge wall map from Little Passports, and the boys now know the continents and oceans! The boys love working together to match the items in the activity booklet to the right country. We received a music CD as a souvenir this month, with many songs from all around the world. The boys enjoyed hearing music from different places. Thanks for stopping by to check out this sneak peek into Little Passports! Leave me a comment if you have any questions, or if you have Little Passports already, let me know how you and your children enjoy using this amazing program! These look so cute and fun!